From April 21st to 28th, Magneti Marelli will be at the 17th Edition of Auto Shanghai - International Automobile Industry Exhibition. We'll be in Hall 5.2, Stand 5B F151. Under the concept "New Roads for Innovation", the themes developed by Magneti Marelli are related to "China 6" standards, with solutions tailored for the Chinese market that combine technological added value with appropriate costs. The most prominent technological themes are: hybrid/electric propulsion, optimization of the internal combustion engines with GDI direct injection systems, advanced lighting systems and the future developments of Autonomous Driving, HMI and Cyber Security. Today, Auto Shanghai opened its doors, one of the most important international trade exhibitions dedicated to the automotive sector that, in the last edition in 2015, reached record numbers with 2000 exhibitors, over 1300 cars on display and almost one million visitors. Magneti Marelli confirms its traditional presence at the Shanghai exhibition to maintain its specific commitment to the world's premier car market, and to highlight some state-of-the-art technology that is ready to meet the "China 6" standards. This is the package of measures designed to reduce automotive emissions that will come into force on 1st July 2020. In terms of growth, Magneti Marelli's progression confirms the positive trend of the last decade: currently, Magneti Marelli's Chinese business is worth about €750 million (as at the end of 2016), including unconsolidated joint ventures, with a growth rate in the last year of more than 30%. In China, Magneti Marelli employs over 4,100 people in eleven plants throughout the country (this will become 12 in June, with the opening of our Changchun plant, in a joint venture with Fudi). Magneti Marelli's commitment in China, in addition to being reflected in its economic performance, is also expressed in the business profile that the company has built over the past 20 years in the Chinese market, with the capability to provide appropriate products and technologies that are tailored specifically for this market, offering solutions at the right price, and developed by local teams. In this way, Magneti Marelli is succeeding in its objective of adding technological and business value and meeting the needs of Chinese and international manufacturers in the country. Regarding technology, the focus of Magneti Marelli's presence at Auto Shanghai is on proposing solutions to satisfy the parameters set out under the "China 6" standards. In our 350 m2 stand, located in Hall 5.2 (stand 5B F151), we are presenting technologies from all our business areas, formulated to comply with demands of legislation regarding energy efficiency and reduced consumption and emissions. Still in the powertrain area, the hybrid-electric solutions are displayed, with engines - and their electronic controls - ranging from 48 Volts and 14 Kw of power to 800 Volts and 340 Kw of power. The PERF.E.T. (PERForming and Efficient Transmission) hybrid-electric system it’s also be on show, an ideal synthesis of the technology transfer process between the "racing" world and the "road", that combines the AMT (Automatic Manual Transmission) with a motogenerator derived from the KERS system (an hybrid system for the recovery of the kinetic energy while breaking, introduced in Formula 1): the electric motor produces torque during the gear change and at the same time helps to reduce fuel consumption. The electric engine made by Magneti Marelli for competitions, that has been adopted by the Mahindra M3 Electro in the Formula E Championship, is another example of Magneti Marelli's ability to transfer technological expertise from the racing circuit to the street, and vice versa. Magneti Marelli's electric engine is extremely compact (weighing 23 kg) and can develop 200 Kw of power. Closely connected with our powertrains, we are also showing exhaust systems for petrol and diesel engines that are designed with "China 6" standards in mind. Another key trend in the automotive world is Autonomous Driving for which we at Magneti Marelli are drawing technologies from our various fields, shown at Auto Shanghai 2017. The first development is Smart Corner, already exhibited at CES Las Vegas 2017, that uses the areas of the car traditionally reserved for lighting systems - i.e. the corners - to bring together the various sensors useful for autonomous driving into one unit. Freeing up interactivity between user and vehicle, Autonomous Driving will increasingly bring HMI, or Human-Machine Interface, to the fore. In this sense, our electronics business line, that combines know-how across the areas of instrument clusters, display, infotainment and telematics, presents an integrated approach to developing HMI (Human Machine Interface) that characterises the interior and dashboard with large areas allowing interaction with various vehicle systems based on ergonomic, functional and graphical criteria. Transecting the development of future powertrain and electronic system technologies, Cyber Security takes on a dominant and crucial role because in cars that are increasingly connected and managed electronically, it's necessary to enable adequate safeguards to ensure the safety of all road users. Thanks to its across-the-board know-how, Magneti Marelli is developing Cyber Security solutions that enable all components of the car to communicate safely and effectively. The goal is to provide unique encryption and encoding for crucial systems such as instrument clusters, infotainment, electronic control units and even powertrain components, such as motorised throttle bodies. Magneti Marelli’s approach to Cyber Security is based on a set of hardware and software products: Intrusion Detection Systems (IDS), “Data Diode” System of On-Board Diagnosis (OBD) Port Securization, Cyber Security software Stack for Hardware Security Modules (HSM), Cryptographic Libraries, Body Computer Secure Gateway. In addition to the vision of the future crossing through the frontiers of "China 6" and Autonomous Driving, all key products that are currently available will be on our stand. Starting with electronic systems, we will highlight our 12.3" instrument screens, developed for SAIC, and the new 10.25" and 12.3" curved display solutions presented at CES 2017 in Las Vegas. We have more infotainment solutions, with "black panel" effect displays and "optical bonding" technology" to improve the readability of screens, used in the Alfa Romeo Giulia and the Alfa Romeo Stelvio. The latest version of Smart Antenna is also showing on our stand, which integrates telematics box and infotainment system functions in one device. Regarding lighting, Magneti Marelli has established an industrial presence in all major Chinese automotive manufacturing hubs, with presence in Wuhu, Foshan, Xiaogan and, soon, also in Changchun. At the stand, the technologies are displayed with the help of a "light channel" in the dark, ranging from full-LED headlamp for the SAIC Volkswagen Group to the LED lights for the new DS7, as well as headlamps and lights chosen by world leading manufacturers. Visitors to the stand can engage themselves in an immersive viewing experience thanks to three holo-boxes where are presented the capabilities of the Audi R8s dazzling Laser modules, the BMW 7 Series' LED lights and electronic lighting systems. From our work with Shock Absorbers, alongside examples in aluminium and composite materials, there is also a prototype regenerative shock absorber. It is a mechatronic shock absorption system that converts the suspension's kinetic energy while driving into electrical energy that will charge the vehicle's battery. Traditionally, wide coverage is given to Motorsport activities with, in addition to our Formula E electric motor, full TFT (Thin Film Transistor) displays ranging from 6.5" to 8.8", and data loggers with bi-directional wi-fi connection and inertial platform. Technology from our Suspension Systems, Plastic Components and Modules and Magneti Marelli Aftermarket network business areas complete our exhibition. 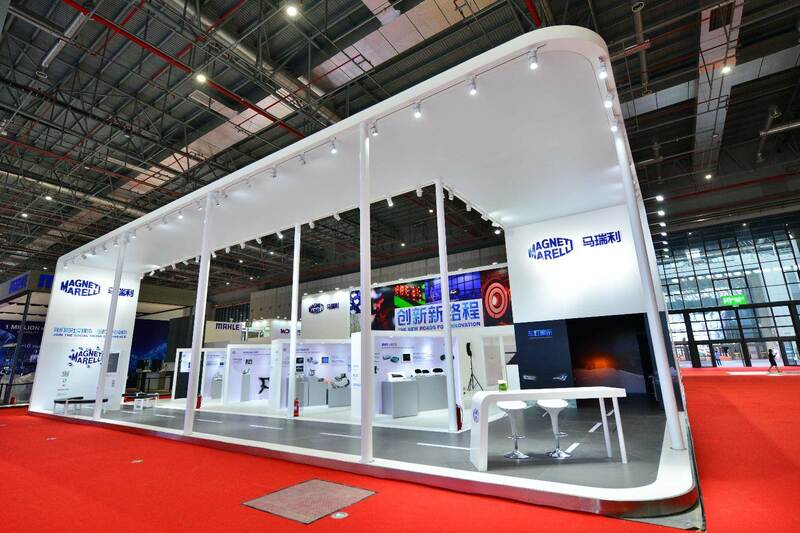 Visitors can connect with our world throughout the entire stand by engaging digitally with Magneti Marelli's activities in China on social media channels, such as WeChat, Weibo, Youku and Iquyi. Magneti Marelli has been present in China since 1996 with production plants and R&D/Engineering Centres in Shanghai (New Headquarters just opened in May 2016, SAGW Powertrain JV), Wuhu (Automotive Lighting and Powertrain), Guangzhou (Electronic Systems, Suspension Systems and Plastic Components and Automotive Modules), Changsha (exhaust systems), Hangzhou (Shock absorbers in JV with Wanxiang Qianchao Company), Changchun (Powertrain and Lighting in JV with FUDI), Hefei (exhaust systems with JAC and Lingdatang), Foshan (Automotive Lighting) and Xiaogan in the province of Hubei (China South Industries Group Corporation - CSI Automotive Lighting JV).